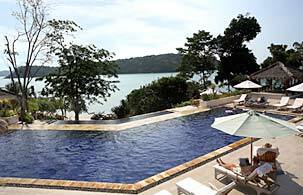 Just 20 minutes drive from Phuket international Airport, Absolute Chandara Resort & Spa lies along the scenic coast of Por Bay and marinas overlooking the sea dotted with uninhabited islands. This 5-star resort offers a total of 49 villas and suites in four different types. Those are Jacuzzi Suite Villa, Family Villa, One Bedroom Pool Villa and Two Bedroom Pool Villa. Absolute Chandara Resort & Spa proud of its utmost serene ambiance and privacy, fully-equipped facilities and unrivalled services that will make your everyday here a precious moments. For those who seek for a memorable family vacation, a pleasant corporate pow-wow, a romantic getaway or honeymoons or an ideal escape in Phuket, This is it. Though the resort are surrounded by mature trees and other tropical vegetation, it allows an easy access to lots of island's facilities. The Beach Terrace: Serving Thai and International cuisine for breakfast, lunch and dinner. Dine alfresco all they long from 6.30 am – 11.30 pm. Pool Bar: Cool cocktails and favorite snacks to enjoy at the poolside. Benefits from Happy hours every evening from 5-7 pm, with 50 % discount on beverage. Open daily: 10.00 am – 11.00 pm. Chandara Spa has been designed to be a place where guests can rebalance body and mind with the secrets of natural healing. Discover the peace within and bring back your energy through a wide range of massage along with body and beauty treatments. Here, a Thai Touch and Balinese charms will soothe your spirit. 8 treatment rooms, 2 spa villas, beauty salon, and health bar service you daily from 08.00 am – 09.00 pm.